The Perth Mint has started accepting orders for their first ever “glow in the dark” silver coin. 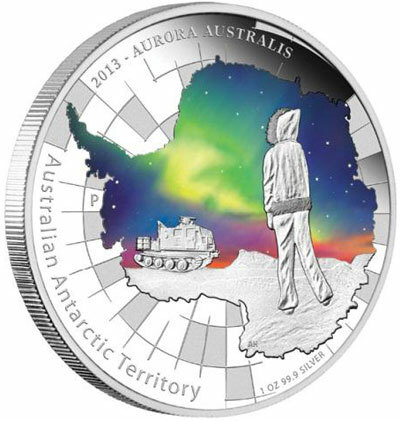 Released as part of the Australian Antarctic series, the coin features a depiction of the Aurora Australis colored with glow in the dark ink. The Aurora Australis or Southern Lights is a dramatic display of colored light seen in the night sky above the polar regions. This phenomenon occurs when charged particles from the sun collide with gases in the upper atmosphere creating moving ribbons and arcs of light comprising thousands of colors. The reverse design of the coin features a scene of a snowfield with a tracked vehicle and human observer. In the night sky above is a representation of the Aurora Australis, colored with glow in the dark ink. The surrounding inscriptions include “2013 Aurora Australis”, “Australian Antarctic Territory” and “1 oz 99.9 silver”. To illuminate the ink, the coin should be held below a light and then viewed in a darkened room. The obverse of the coin features the Ian Rank-Broadley effigy of Queen Elizabeth II with inscriptions “Elizabeth II”, “Australia”, and “1 Dollar”. The coin is issued as legal tender under the Australian Currency Act of 1965. Each coin contains 1 troy ounce of 99.9% pure silver struck to proof quality. The diameter is 40.60 mm with a thickness of 4.00 mm. Packaging includes a presentation case and outer shipper with a numbered certificate of authenticity. The Perth Mint will release no more than 7,500 of these coins worldwide. For more information or to place an order, please visit the Perth Mint product page.